Here’s some cold, hard truth about content marketing: No matter how good you get at your job, you need to continually upgrade your skills and processes. Consider the case of search engine optimization. The SEO techniques that we’ve come to know and respect primarily revolve around the almighty algorithm: The search engine’s quality team (at Google, Bing, Yahoo, etc.) determines what criteria it will include in its ranking system, then builds a mathematical formula that evaluates, retrieves, and displays the content that satisfies its terms. Today’s algorithms do a pretty good job of using input like keywords, content quality, and uniqueness to rank content by its relevance. But what if those formulas could learn from the actions taken on previous searches, predict the intent behind a query, and apply this new contextual information to provide a more meaningful search experience – without Google’s search team reconfiguring its code? It may sound more like science fiction than search functionality; but it’s a concept called deep learning (aka machine learning). And the truth is it may be in the works. 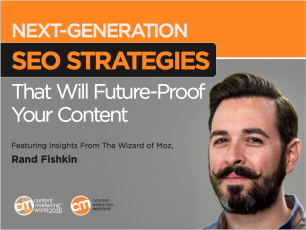 In his highly popular Content Marketing World session on the future of SEO, the Wizard of Moz, Rand Fishkin, pointed out some ways Google already takes user insights and actions into account when serving up content. 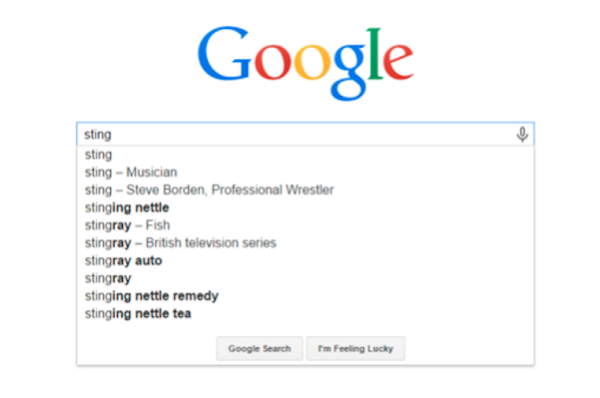 Over the last few years Google began to identify specific entities of knowledge — e.g., distinguishing between searches on Sting, the musician, and sting, the sensation of pain. By accounting for these contextual semantics, Google offered segmented auto-predictions on relevant search terms and phrases. What changes does Rand see next on the horizon as search engines grow as smart as their engineers? We’ve compiled the top insights from Rand’s Content Marketing World presentation into a new e-book: Next-Generation SEO Strategies That Will Future-Proof Your Content. But first, here are some highlights, along with tips that will help your content find success in the age of more sentient SEO. Smart search engines will be able to tell if your content is getting more clicks than results that appear above it on the search engine results page (SERP) – and may reward your content with a boost in its ranking. Future-proof your SEO: Once every click starts to count as a vote for relevance, you need to optimize your content to satisfy all the criteria a user might rely on when choosing among search results – not just your content’s keywords and meta descriptions. Does the title match what they might be looking for? Does the URL seem compelling and consistent with their interests? Is there a drop-down description of our brand, which would signal that our content is reputable (e.g., the Space.com drop-down indicator above)? Will our website domain be familiar to the searcher? Will this content be recent enough to address their needs or is it too dated to be relevant? Does the content description pique their interest or demonstrate that they will find what they are looking for? In the near future, it will be essential to beat your competition on factors like engagement if you want to hit the top spots on a SERP. Content that causes users to “pogo stick” or jump right back to the results page after clicking won’t retain its search value nearly as well as content that drives the “long click” – when users find valid reasons to stick around. Ensure that your page loads quickly and completely: Making searchers wait for a video to buffer or an image to render can drive them to try their luck on a different search result so make sure you have adequate bandwidth to support your content collection. Provide a quality user experience that works on all browsers, platforms, and devices: Mobile, desktop, tablet, iOS vs. PC – no matter how searchers prefer to access the content, they should arrive at an interface that functions cleanly and correctly. Compel your visitors to explore your site more deeply: Once you’ve gotten their initial click, retain their interest by serving up additional content resources that might be relevant to their search. Minimize distractions: Pop-ups, auto-playing videos, or requests for subscription sign-ups may hold marketing value for your brand, but these features can delay the payoff, irritating repeat visitors and dissuading new ones from discovering a reason to stick around. As search engines rely more heavily on predictive modeling, their highest rankings will likely be reserved for content that provides lasting value. 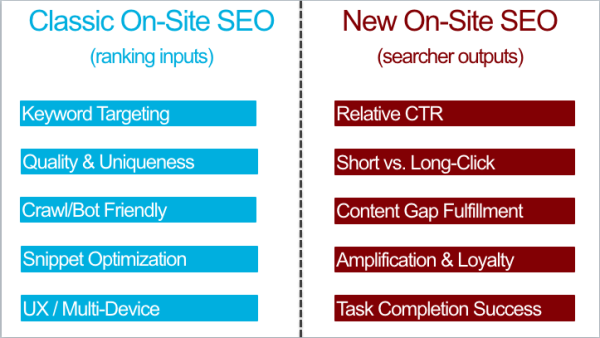 In other words, the better your content is at satisfying the informational needs a visitor may have next (i.e., after their current query has been addressed), the more relevant it will be in the eyes of the algorithm. Terms related to the competitive landscape – For example, if you are targeting people who search for “best fitness trackers,” try including industry-leading brand names like Fitbit, Apple Watch, or jawbone. Terms with a semantic relation – For example, if you are targeting people searching for New York City vacations, include words like Brooklyn and subway to indicate more comprehensive coverage of the topic. Terms that indicate community membership – If you are trying to reach a niche audience, use terms that identify your business as an insider who speaks their language and understands what their lifestyle is like. While there are too many variables involved in social sharing for the search engines to rank by pure numbers, Rand believes the next-gen engines will start to emphasize the engagement that is relative to these shares – in other words, how quickly your content’s share rates are accelerating (or decelerating) over time, and how often those shares are resulting in loyalty and return visits. Shares and links per 1,000 visits – Check with social-sharing trackers like TrueSocialMetrics or Hootsuite to gauge how often your viewers take the additional initiative of sharing or linking to your content. If your averages are consistently increasing – even slightly – the smart search engines will likely take notice. Return visitor ratio over time – While breaking down return visits week over week or month over month won’t necessarily tell you why visitors are returning, it will show if your content is trending in the right or wrong direction – a factor that sentient search engines may consider in their ranking determinations. Say you are searching for new jeans. Wouldn’t you prefer to search on sites that you can purchase from directly rather than go down a rabbit hole once you’ve tracked down the perfect pair? Tomorrow’s search engines prefer the simpler option too and will reward content that enables users to complete their desired transactions quickly, conveniently, and in as few clicks as possible. Conduct surveys and usability studies: They are a great way to gather information about what searchers (or potential searchers) are actively seeking, what they want to find on a page, and what tasks they might be doing that your content will need to enable. Include customization tools in your content offerings: These could be comparisons, configuration engines, apps that enable consumers to “try before they buy,” or widgets that let visitors personalize the content they see when they return to your page. For more details on these five search inputs – and how you can prepare your content for their arrival – check out the complete e-book below. And if you would like to learn even more from Rand, you won’t want to miss his presentation at Content Marketing World 2016: The Worst Advice Marketing Ever Gave to Content. Register with code BLOG100 to save $100 off main event and all-access passes.